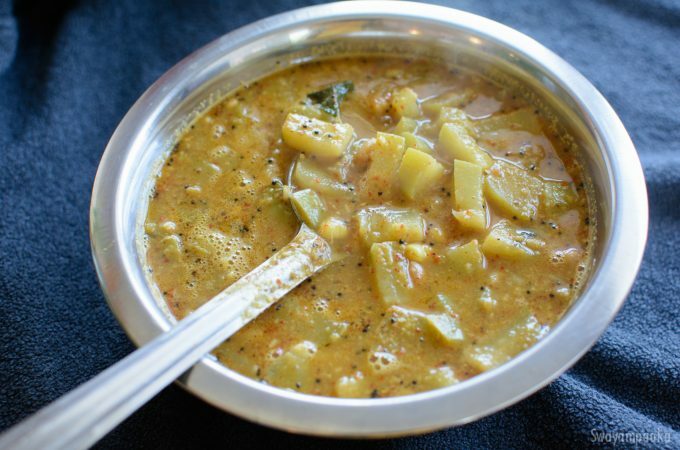 Chayote kootu or chow chow kootu / Seeme Badane kayi kootu is one of the Iyengar’s recipe. I got this kootu recipe from my friend. It is more like our huLi or sambar but they call it Kootu. Seeme Badane kayi or chow chow / chayote squash / Cho-Cho is a low calorie food and high in vitamin C. It is rich in flavonoid antioxidants which help to protect the body against inflammation caused by free radicals. It is good to incorporate different vegetables everyday in your diet. Here is simple seeme badane kayi kootu recipe. You should try this delicious Chow chow chutney, Palya and seemebadanekai Sambar as well.